Fire up the grill! Here’s a recipe that you can enjoy as an appetizer, main dish or afternoon snack. 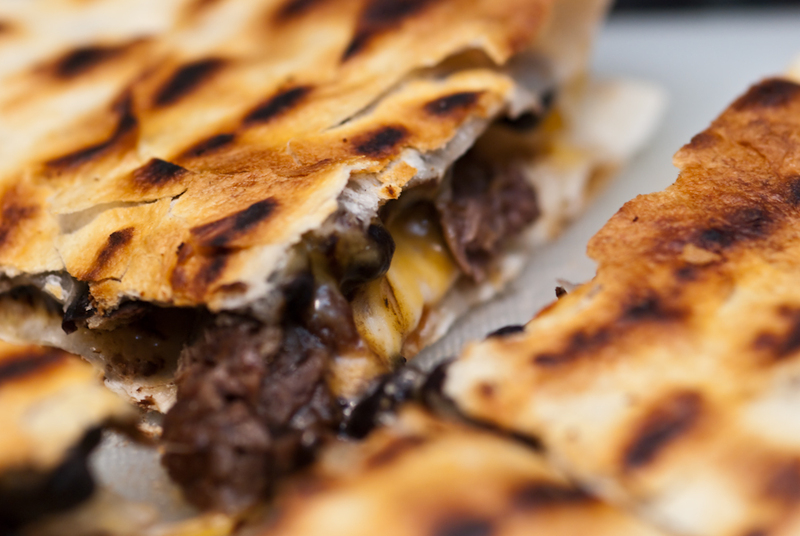 Homemade quesadillas are simple to make and cook fast on the grill. And you can mix and match all kinds of ingredients so that you never make the same quesadilla twice. Puerto Rican cooking is becoming a way of life in Stacey’s kitchen, so she made quesadillas this week with churrasco, or skirt steak. We found a great Cuban churrasco recipe complete with marinade and a chimichurri sauce, which we plan to try soon. To simplify things on a busy weekday, Stacey gave the half-pound slab of meat a lovely massage with Adobo seasoningand a little bit of extra virgin olive oil and then let it rest prior to putting it on the grill. After cooking it to the desired level of doneness, move the meat to a cutting board and let it rest. While the steak cooks, take one large tortilla, place it on the grill (or on foil if you think the filling might fall onto the coals) and put a thin layer of shredded cheese on the tortilla, a thin layer of black beans (we used leftovers from last night’s meal) and let the cheese melt to hold the beans onto the tortilla. While the cheese melts, cut the churrasco into thin slices. Add in some more shredded cheese to act as the glue that will keep the churrasco and other ingredients – like sliced peppers or tomatoes – together. Now it’s time to flip. Say a little prayer as you quickly, gently and deliberately flip the quesadilla. Don’t worry if you mess up the first few, it happens all the time. Once you see the cheese melting and the bottom of the tortilla gets brown, you’re ready to pull it off the grill and enjoy your meal. How Stacey Got the Shot: With her husband salivating, standing near his dinner. Oh, and with the 105mm f/2.8 at f/4.5 in 1/60 of a second with the flash bounced.